A memory module has a an array of connections. The array of connections is arranged in rows and columns such that there are first and second outer columns. Connections in the first and second outer columns can be interchanged to optimize double-side module placement on a substrate. 当前，诸如双列直插存储器模块（DIMM)的存储器封装（package)可以驻留在印刷电路板（PCB)或其他基底（substrate)的两面上。  Currently, such as dual inline memory module (DIMM) in memory packages (package) may reside on both sides of a printed circuit board (PCB) or other substrate (Substrate) a. 这为系统增加存储器密度。 This increases the density of the memory system. 用于存储器的信号可以路由通过可以具有几层的基底。 A memory signal may be routed through the layers of the substrate may have. 当在基底的两面上都有存储器封装时，信号路由和完整性可能成为问题。 When the memory packages are on both sides of the substrate, signal routing and integrity can be a problem. 被路由通过基底的信号可以连接到封装的相对面上的球或到DMM的连接。  The signal is routed may be connected through the substrate to the opposite surface of the sphere to the connection of the package or the DMM. 例如， 到基底的一个面上的封装的最近侧的信号一般将无需必须到所述基底的另一个面上的封装的最远侧。 For example, a signal of a package side surface nearest to the substrate will generally need not necessarily the most distal to the package on the other face of the substrate. 用于封装的另一个面的DIMM被“颠倒”以将它安装在另一个面上，导致来自信号源的相关连接处于封装的另一个面上。 DIMM for encapsulation is the other face of the "reversed" to install it on the other surface, resulting in correlation from a signal source is connected to the other surface of the package. 根据本发明的一个方面，提供了一种存储器模块，包括：连接阵列，所述连接阵列被排列成行和列，从而有第一和第二外围列，并且所述第一和第二外围列中的连接被标识为供可互换信号使用，其中所述第二外围列位于所述连接阵列的与所述第一外围列所在的一侧相对的一侧。  In accordance with one aspect of the present invention, there is provided a memory module, comprising: an array of connections, the connection array is arranged in rows and columns, so that there are first and second outer columns, and the first and second connecting outer columns are identified as a signal for use interchangeably, wherein a side opposite to a side of the second outer columns positioned where the array is connected with the first outer columns. 根据本发明的另一方面，提供了一种存储器系统，包括：第一存储器模块，所述第一存储器模块被安装在基底的第一面上，所述第一存储器模块包括：连接阵列，所述连接阵列被排列成行和列，从而有第一和第二外围列，并且所述第一和第二外围列被标识为供可互换信号使用；第二存储器模块，所述第二存储器模块被安装在所述基底的第二面上，所述第二存储器模块包括：连接阵列，所述连接阵列被排列成行和列，从而有第一和第二外围列，并且所述第一和第二外围列中的连接被标识为供可互换信号使用；存储器控制器，所述存储器控制器控制所述存储器模块的第一和第二外围列之间的信号的互换；所述基底中的信号迹线，其中所述第一和第二存储器模块的所述第一和第二外围列中的所述连接被排列，从而在所述迹线上路由的信号具有一致的  According to another aspect of the present invention, there is provided a memory system, comprising: a first memory module, the first memory module is mounted on a first surface of the substrate, the first memory module comprising: a connector array, the array of connections arranged in rows and columns is that there are first and second outer columns, and the first and second outer columns is identified as a signal for use interchangeably; a second memory module, the second second memory module is mounted on a second surface of the substrate, the second memory module comprising: a connector array of said connector are arranged in rows and columns of the array, so that first and second outer columns, and the second connecting a second outer columns and are identified as a signal for use interchangeably; interchangeably memory controller, signals between outer columns of the memory controller controls the first and second memory module; the said signal traces in the substrate, said first and second memory module, wherein said first and second outer columns are connected are arranged to have a consistent signal in the trace route 路由长度，其中所述第二外围列位于所述连接阵列的与所述第一外围列所在的一侧相对的一侧。 A side opposite the first peripheral side of the row with the route length, wherein the second outer columns positioned in the connector array. 根据本发明的又一方面，提供了一种设计存储器设备的方法，包括：确定存储器信号的可互换集和存储器信号的固定集；在连接阵列的外围列中排列存储器信号的所述可互换集；以及在连接阵列的内部列中排列存储器信号的所述固定集，其中，所述内部列是位于所述连接阵列的中间处的列，且所述外围列是位于所述连接阵列的边缘处的列。  According to another aspect of the present invention, there is provided a method of designing a memory device, comprising: determining a fixed set of interchangeable set of memory signals and a memory signal; the arrangement of memory signals in outer columns of the array are connected said interchangeable set; and the fixed set of memory signals arranged in the interior of the column is connected array, wherein said inner column is a column located at the middle of the array are connected, and the outer columns is located column is connected at the edge of the array. 图1示出双面双列直插存储器模块安装的现有技术实施方案。  Figure 1 shows a prior art double-sided double row embodiment inline memory modules installed. 图2示出双面双列直插存储器模块安装的实施方案。  FIG. 2 shows a double-sided dual in-line memory module embodiment installed. 图3示出基底上存储器封装的可替换的排列。  FIG 3 shows an alternative arrangement of the memory package substrate. 图4示出使用双面存储器模块的存储器系统的实施方案。  FIG. 4 shows an embodiment of a double-sided memory module of the memory system. 图fe和恥示出堆叠存储器模块的可替换的实施方案。  FIG fe and shame stacked memory module shown alternative embodiments. 图6示出用于具有互换性的双列直插存储器模块的实施方案的连接表。  FIG. 6 illustrates a table used in connection with an embodiment of the compatibility of the dual inline memory module. 图7示出用于双列直插存储器模块的可替换实施方案的连接表。  FIG. 7 shows an alternative embodiment of the connection table for a dual inline memory module. 图8示出用于双列直插存储器模块的另一可替换实施方案的连接表。  FIG. 8 shows a dual inline memory module of another alternative embodiment of the connection table. 图9示出设计双列直插存储器模块的方法的实施方案的框图。  FIG. 9 shows a block diagram of a method of dual in-line memory design module embodiment. 通路13以比信号迹线大的节距（pitch)被制造以承担特大的宽度，并且几个通路的使用可以限制迹线的数量，所述迹线可以被布线通过基底10的单个层。  In passage 13 is larger than the signal trace pitch (Pitch) is made to assume a large width, and the use of several paths can limit the number of traces, the traces can be routed through a single base 10 Floor. 这可以引起附加的层和额外的成本。 This can cause additional layer and additional costs. 另外，为了避免信号短路进基底10的内部电源和接地平层，通常在电源层中使用反面焊盘，所述反面焊盘的使用妨碍模块内存储器的功率传输。 In order to avoid a short circuit signal into the internal power and ground layer of the substrate 10, the back pad is generally used in a power supply layer, a back pad impede the transmission power within the memory module. 双数据率存储器（DDR)既使用时钟信号的上升沿又使用时钟信号的下降沿来操作存储器，导致两倍于使用时钟信号的前沿（leading edge)或下降沿的存储器速度。  The double data rate memory (DDR) using both the rising edge of the clock signal and the falling edge of the clock signal used to operate the memory, resulting in twice the memory speed in the leading edge (leading edge) using a clock signal or a falling edge. DDR3 为DDR的第三个版本。 DDR3 is the third version of DDR. 在DDR3中，以及其他存储器类型中，命令/地址总线为菊链式或“飞越（fly-by)”总线。 In DDR3, and in other types of memory, the command / address bus or a daisy-chained "fly (fly-by)" bus. 这种类型的总线可能具有由不等布线长度而产生的信号完整性问题， 所述不等布线长度由双面存储器安装弓I起。 This type of bus signal integrity problems may have varying wiring lengths generated, the unequal length of the mounting wire bow I double-sided memory. 如图1中所示，信号16a具有连接20与沈之间的第一路由长度^a。  As shown in FIG. 1, the signal 16a having a length of a first route connecting between the sink 20 and ^ a. 第二路由长度在模块1¾上的连接沈与模块1½上的球30之间。 The ball 30 on the second length in the routing module and sink module 1¾ connected between 1½. 第二路由长度28b远远小于第一路由长度。 The second route is much smaller than the length of the first route length 28b. 对于信号16b来说也发生相似的长度差异，其中第一路由长度为从连接22到连接24，并且第二路由长度为从模块1¾上的连接M到模块14b上的连接32。 For the signal 16b is also undergone a similar length difference, wherein the length of the route from the first connection 22 to connection 24, and the second route length from the module M is connected to 1¾ connector 32 on the module 14b. 必须注意虽然连接20、22、M、26、30、32、34和36在这里被示为焊球，但是它们可以是用于在集成电路管芯（die)和基底之间提供连接的任意类型的连接。 It must be noted although the connection 20,22, M, 26,30,32,34 any type and is shown here as balls, they may be used to provide a connection between the integrated circuit die (Die) and the substrate 36 Connection. 路由长度中的差异导致不一致的有效信道阻抗。 Difference  lead to inconsistent routing lengths effective channel impedance. 这限制设备接收可识别信号的能力。 This limits the ability device receiving the identification signal. 典型地，系统被设计为具有被非常规律和均勻地间隔的负载，并且线被调整为匹配所述负载。 Typically, the system is designed to be a load having a very regular and evenly spaced, and the line is adjusted to match the load. 如果没有匹配阻抗，则信号完整性变得不确定，并且不能支持更高的数据率。 If there is no matching impedance, signal integrity becomes uncertain, and can not support higher data rates. 在一个途径中，现有技术已尝试在管芯本身的半导体中完成布线。  In one approach, the prior art has attempted to complete the wiring of the semiconductor die itself. 使用管芯中的逻辑“镜象反射”信号，连接被重定义为不同的信号。 Die using a logical "mirror reflection" signals, the connection is re-defined as different signals. 数据通道中所需要的逻辑在通道中引入延时，并在设备制造中引入开销（overhead)。 Logical data path introduces a delay in the desired channel, and introduced into the overhead (overhead) in the manufacture of the device. 在存储器模块级互换各个连接的物理连接性是可能的，以在提供与镜象反射相同的益处的同时，避免在数据通道中引入逻辑。  In the memory module connected to the respective physical interchange stage of the connection is possible, to simultaneously provide the same benefits of the reflection mirror, to avoid the introduction of data in the logical channel. 实施例在图2中被示出。 Example embodiments are illustrated in FIG. 在本实施方案中路由长度已变得一致。  In the present embodiment, the length of the route has become uniform. 使用在此，术语“一致的”并不意味它们精确地相同，虽然情况可能是这样的。 Used herein, the term "identical" does not mean that they are exactly the same, although this may be the case. 使用在此，一致意味着信号通道中的阻抗在负载之间彼此紧密匹配。 In this use, consistent impedance means in the signal path between the load closely match each other. 路由长度1现在为从连接20到连接30的长度，并且路由长度2为从连接30 到未示出的下一个设备上用于同一信号的连接的长度。 A route length from the connection 20 is now connected to the length of 30 and a length of 2 routes as the length for the same signal from the connector 30 to the next device (not shown) is connected. 负载现在被更加一致地间隔，这允许设备以良好的信号完整性支持更高的数据率。 Now load more consistent spacing, which allows good signal integrity device to support higher data rates. 另外，在图2中示出的配置具有数量减少的通路。  Further, in the configuration shown in FIG. 2 with a reduced number of passages. 来自底面存储器模块12b和14b 的远侧的信号已移动到近侧的互换允许信号共享通路。 Signal from the bottom surface of the memory module 12b and distal 14b is moved proximally to allow signal exchange common path. 减少通路的数量放松对迹线间隔的约束，允许更多的迹线被放置在给定层中。 Reducing the number of paths to relax constraints on the trace interval, allowing more traces are disposed in a given layer. 这又可以减少在基底中所需要的层的数量，减少成本，并且减轻电源面和接地面中的短路。 This in turn may reduce the number of layers required in the substrate, reduce costs, and reduce the short-circuit power plane and the ground plane. 为了使这个途径实用，必须有一些信号可以在模块的两侧之间互换。  In order to make this practical way, there must be some signals may be interchanged between the two sides of the module. 为了允许对可互换信号的定义的更好理解，讨论通常如何在基底上布图（lay out)存储器模块是有帮助的。 To allow a better understanding of the definition of interchangeable signal, typically discuss how the layout on the substrate (lay out) memory module is helpful. 如图3中所示，存储器控制器38具有64字节（byte)的数据输出。 As shown in FIG., The memory controller 338 has 64 bytes (byte) data output. 基底10上的每个模块40a-40h为X8模块；每一个能接收8字节的存储器。 Each module substrate 10 40a-40h is X8 modules; each can receive 8 bytes of memory. 必须注意到在本发明的一个实施方案中，可以这样选择可互换的信号，即不同类型的封装的占地面积（footprint)可以被最优化。  In one embodiment to be noted that the embodiment of the present invention, the selection signal may be interchangeable so that different types of packaging area (footprint of) can be optimized. 例如，如存储器模块40a中所示，数据线已被这样排列，即封装为X4/X8封装，数据线为用于X4存储器的DQ0-3，或者用于X8封装的DQ0-7。 For example, as shown in the memory module 40a, data line has been arranged such that the package of X4 / X8 package, the data lines for the memory DQ0-3 X4, X8 or for packaging DQ0-7. 如果封装为X16封装，则所有数据线存在并且DQ0-15针对可互换性可用。 X16 package if the package is, all data lines and DQ0-15 present available for interchangeability. 同样地， 当数据线在诸如DQW:7] ^P DQ [8:15]的字节“路(lane) ”内互换时，如果可互换性被限制在诸如DQ [0:3]、DQ[4:7]、DQ[8:11]和DQ [12:15]的半字节内，则可互换信号对不同封装类型的适应性被增强。 Similarly, when the data line, such as DQW: when interchanged within 7] ^ P DQ [8:15] byte "path (Lane)", if such interchangeability is limited to DQ [0: 3], DQ [4: 7], the DQ [8:11] and DQ [12:15] nibbles, the interchangeable signal is enhanced adaptability to different package types. 可互换性实际上发生在控制器38处。  interchangeability actually occurs at the controller 38. 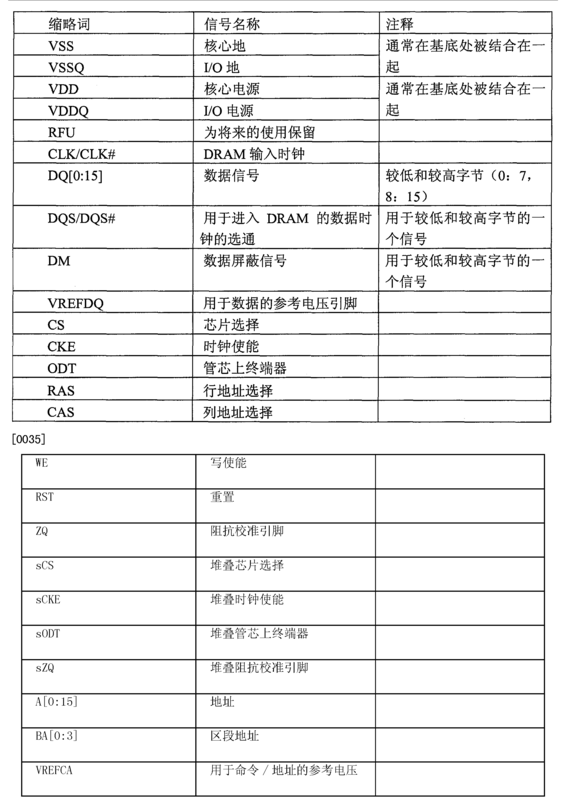 DRAM和DIMM不具有关于数据上是什么、这个数据实际上是用于DQl还是DQ15的“知识”。 DIMM DRAM and does not have data about what is on, this data is actually used DQl DQ15 or "knowledge." 因此，这些信号是可互换的。 Therefore, these signals are interchangeable. 如将要继续进一步讨论的，其他类型的信号已被标识为可互换。 As will be discussed further continue, other types of signals have been identified as interchangeable. 必须注意到当控制器的数据输出为64 字节时，还有地址信号和基于等级的信号以菊链或“飞越”的方式从控制器被发送。 It must be noted when the data output of the controller is 64 bytes, and the address signal and the signal level based on daisy chain or to "fly" manner is transmitted from the controller. 沿总线传递信号，并且针对相关连接到这个总线之间的距离，路由长度被期望为一致。 Transmitting signals along the bus, and for a connection related to the distance between the bus, route length is expected to coincide. 如图2中所示，从连接传送的信号的互换提供这种一致。 As shown in FIG. 2, to provide such a consistent signal from the exchange is connected to the transmission. 在大多数存储器布局中互换性是可能的。  In most of the interchangeability of the memory layout is possible. 例如，图4中的存储器系统采用双面存储器基底。 For example, FIG. 4 of the memory system memory double-sided substrate. 除了面向读者的面上的模块40a-40h外，诸如42a的模块处于背向读者的面上。 In addition to the module for the reader's outer surface 40a-40h, 42a such as a module in the surface facing away from the reader. 一般使用诸如芯片选择（CS)信号的基于等级的信号来寻址被排列成这种系统的存储器模块。 Is generally used such as a chip select (CS) signal based on the signal level of such a system are arranged to address the memory module. 在这个特定实施方案中，地址和用于两种不同等级的基于等级的信号被示为出自控制器。 In this particular embodiment, the address for two different grades are based on a signal level as illustrated by the controller. 基于等级的信号一般不可互换。 Based on the level of a signal generally not interchangeable. 相似地，可以使用诸如在图如和恥中示出的“堆叠”存储器模块实现可互换性。  Similarly, may be used such as the illustrated "stacked" memory module for interchangeability and shame as in FIG. 图fe示出一种堆叠存储器排列的实施例，其中两个存储器管芯4½与44b之间的连接处于内部，并且它们使用诸如球46的公共连接阵列。 FIG fe shows an embodiment of a stacked memory array, wherein the connection between the two memory die is inside 4½ and 44b, and they use a common connection of the array 46 such as a ball. 在图恥中，每个模块4½和44b具有它们自己的诸如焊球46a和46b的外部连接阵列。 In FIG shame, each module 4½ and 44b have their own external connections such as solder balls array 46a and 46b. 在这种排列中也可以采用可互换性。 In such an arrangement may be used interchangeability. 模块一般以行和列的方式被排列为连接阵列。  In a general manner module are arranged in rows and columns is connected to the array. 如将关于图6-8所讨论的，虽然三列是可能的，但是连接的排列被假定为至少有四列。 As it will be discussed with respect to FIGS. 6-8, although three is possible, but is assumed to be arranged in connection with at least four. 这个假定基于15或16行乘9列的连接的典型DRAM布局。 9 by connecting this assumption based on a typical 15 or 16 rows of DRAM layout. 一般在中间3列中没有连接，在模块的任一“侧”保持3列。 Usually the intermediate 3 is not connected, in either "side" module 3 is maintained. 在可互换信号的讨论中，几个不同的信号缩略词可能被使用。  In the discussion interchangeable signals, several different acronyms signals may be used. 在下面的表格中包括这些缩略词以及它们的描述。 In the following tables include those acronyms and their description. 可互换信号一般包括字节“路”内的DQ信号，例如DQW:7]和DQ[8:15]。  The signal typically comprises a DQ signal interchangeably in the byte, "path", e.g. DQW: 7] and DQ [8:15]. 区段地址BA[0:3]可互换。 Sector address BA [0: 3] are interchangeable. 可能BA[2:3]不存在，那么只有BAW: 1]可以是可互换的。 Possible BA [2: 3] does not exist, then only BAW: 1] can be interchangeable. 诸如A[3:9] 的行内的地址连接是可互换的。 Such as A: Address in  is connected to the line are interchangeable. 虽然未在本实施例中示出，VDD和VSS连接位置一般也可以到处移动以共享通路。 Although not shown in the present embodiment, VDD, and VSS connection position may be moved around in a generally common path. 图6示出可以允许可互换信号的存储器模块布局的一般实施方案。  FIG. 6 shows a signal may allow interchangeable typical embodiments memory module layout. 如可以看到的，实施例为16X9的连接阵列。 As can be seen, the embodiment of a 16X9 array of connections. 阵列已被排列为9列，其中任一侧上的外围两列51、52、58 和59被标识为供可互换信号使用，并且中间两列53和56被标识为供非可互换信号使用。 The array has been arranged to 9, wherein the peripheral on either side of the two 51,52,58 and 59 is identified as a signal for use interchangeably, and the intermediate two are identified as 53 and 56 for non-interchangeable signal use. 每一侧上的外围两列可互换，提供四个可互换列，或者每一侧上的仅外围一列可互换，提供仅两个可互换列。 Periphery on each side of two interchangeable, four interchangeable columns, or on each side of the periphery of only one interchangeable, only two interchangeable columns. 连接16X9布局的更具体的实施方案在图7中被示出。  The layout of the connection 16X9 more specific embodiments are illustrated in FIG. 在该实施例中，VDDQ和VSSQ已使它们的位置重定义以共享从正面到背面的通路。 In this embodiment, VDDQ and VSSQ has made their position to redefine the shared passage from front to back. 此外，A3与A4、A5与A6，以及A7 与A8可以共享DIMM级的通路。 Further, A3 and A4, A5 and A6, A7 and A8 can access and share DIMM level. 这个特定布局具有更进一步的优点，即DIMM的每行只有4 个信号，允许针对信号迹线的更好的迹线分离，进一步增强信号完整性。 This particular layout has the further advantage that each DIMM only four signal lines, allowing for better separation of traces of the signal trace, signal integrity is further enhanced. 在列52、行J和L 处为未来的使用保留的（RFU)连接可以用于sODT和sCS。 In column 52, row J and L is reserved for future use (RFU) and the connection may be used sODT sCS. 相似地，在列58、行J的RFU可以用于sCKE，并且在列58、行D的RFU可以用于sZQ。 Similarly, in column 58, row J SCKE the RFU may be used, and in column 58, row D may be used RFU sZQ. 想到这些可能的布局，返回到图1和2是有帮助的。  The thought possible layout, returns to Figures 1 and 2 are helpful. 想象连接20和22对应于连接阵列的列1中的一个位置，并且连接对和26对应于列9中的一个位置。 Imagine connector 20 and connector array 22 corresponds to a position 1, and is connected to a corresponding one of position 9 and 26 of the column. 在图1中，这导致不均勻的路由长度和额外的通路。 In Figure 1, which results in uneven lengths and additional routing path. 如果控制器要在列1与9之间互换信号，移动先前已在使用连接22的信号到列9，并且移动先前使用连接沈的信号到列1，则图2中的结果将出现。 If the controller 1 in the column to exchange signals between 9, have previously moved using the signal 22 is connected to the column 9, and the previously used mobile sink is connected to the column signal 1, the results of FIG. 2 will appear. 连接22和沈留在与之前相同的地方，已被路由到那些列的信号被互换，从而连接20 与22，以及M与沈可以被连接在一起。 And sink 22 is connected to remain in the same place as before, has a signal is routed to those columns are interchanged, so that the connection 20 may be connected to 22, and M and Shen. 连接阵列的外围列之间的可互换信号的可用性允许用于双面DIMM或其他模块放置的连接布局的最优化。 Interchangeable Availability signals between outer columns of the array are connected to allow for optimizing the layout of the double-sided connector DIMM modules or other placement. 对可互换信号的进一步调整和变化当然是可能的。  Further modifications and variations of the interchangeable signals are of course possible. 例如，可互换信号还可以被应用到堆叠DRAM技术。 For example, the interchangeable signal can also be applied to the stacked DRAM technology. 另外，可以采用封装类型的变体。 Additionally, the package type of the variant may be employed. 例如，可以使用X16封装以及X4/X8 封装类型。 For example, the package may be used X16 and X4 / X8 package type. 因此，虽然用于存储器模块中的可互换连接的方法和装置的特定实施方案已经被描述到这种程度，但是除了如在所附权利要求书中所阐述的这个范围以外，这种具体的参考并不想要被认为是对本发明的范围的限制。  Thus, although specific embodiments for a method and apparatus of the interchangeable memory module connected to such a degree that has been described, but except as set forth in the appended claims outside this range, this species specific references are not intended to be considered limiting of the scope of the invention. 1. 一种存储器模块，包括：连接阵列，所述连接阵列被排列成行和列，从而有第一和第二外围列，并且所述第一和第二外围列中的连接被标识为供可互换信号使用，其中所述第二外围列位于所述连接阵列的与所述第一外围列所在的一侧相对的一侧。 CLAIMS 1. A memory module, comprising: an array of connections, the connection array is arranged in rows and columns, so that there are first and second outer columns, and connecting the first and second outer columns can be identified as supplied the first column of the peripheral side opposite the side where the signal used interchangeably, wherein the second outer columns positioned in the array with the connection. 2.如权利要求1所述的存储器模块，其中有第三和第四外围列，所述第三和第四外围列被标识为供可互换信号使用，其中所述第四外围列位于所述连接阵列的与所述第三外围列所在的一侧相对的一侧。 2. The memory module according to claim 1, wherein the third and fourth outer columns, the third and fourth outer columns is identified as a signal for use interchangeably, wherein said fourth outer columns are located said side opposite to a side where the third peripheral row of the array is connected. 3.如权利要求1所述的存储器模块，所述存储器模块还包括从由X16和X4/X8组成的组中选择的封装。 3. The memory module according to claim 1, the memory module further comprising a package selected from the group consisting of X16 and X4 / X8 thereof. 4. 一种存储器系统，包括：第一存储器模块，所述第一存储器模块被安装在基底的第一面上，所述第一存储器模块包括：连接阵列，所述连接阵列被排列成行和列，从而有第一和第二外围列，并且所述第一和第二外围列被标识为供可互换信号使用；第二存储器模块，所述第二存储器模块被安装在所述基底的第二面上，所述第二存储器模块包括：连接阵列，所述连接阵列被排列成行和列，从而有第一和第二外围列，并且所述第一和第二外围列中的连接被标识为供可互换信号使用；存储器控制器，所述存储器控制器控制所述存储器模块的第一和第二外围列之间的信号的互换；所述基底中的信号迹线，其中所述第一和第二存储器模块的所述第一和第二外围列中的所述连接被排列，从而在所述迹线上路由的信号具有一致的路由长度，其中所述第二外围列位 4. A memory system, comprising: a first memory module, the first memory module is mounted on a first surface of the substrate, the first memory module comprising: a connector array of said connector are arranged in rows and columns of the array that there are first and second outer columns, and the first and second outer columns is identified as a signal for use interchangeably; a second memory module, the second memory module is mounted on said first substrate two surfaces, said second memory module comprising: a connector array of said connector are arranged in rows and columns of the array, so that first and second outer columns, and connecting the first and second outer columns are identified are used interchangeably as a signal for use; interchange of signals between the memory controller, the memory controller controls the memory module of the first and second outer columns; the signal traces in the substrate, wherein said said first and second memory module of the first and second outer columns connection is arranged so as to have uniform routing lengths of the signal trace route, wherein the second peripheral faithfully 所述连接阵列的与所述第一外围列所在的一侧相对的一侧。 A side opposite to the side connected to the first peripheral array where the column. 5.如权利要求4所述的存储器系统，所述基底还包括多层印刷电路板。 5. The memory system of claim 4, wherein the substrate further comprises a multilayer printed circuit board. 6.如权利要求5所述的存储器系统，信号迹线还包括所述印刷电路板的多个层中的多条信号迹线。 The memory system according to claim 6, further comprising signal traces plurality of signal traces of said plurality of layers of the printed circuit board. 7.如权利要求4所述的存储器系统，以从由X16和X4/X8组成的组中选择的封装形式封装所述存储器模块。 7. The memory system of claim 4, in a packaged form selected from the group consisting of X16 and X4 / X8 package consisting of the memory module. 8. 一种设计存储器设备的方法，包括：确定存储器信号的可互换集和存储器信号的固定集；在连接阵列的外围列中排列存储器信号的所述可互换集；以及在连接阵列的内部列中排列存储器信号的所述固定集，其中，所述内部列是位于所述连接阵列的中间处的列，且所述外围列是位于所述连接阵列的边缘处的列。 A method of designing a memory device, comprising: determining a fixed set of memory signals and the interchangeable set of memory signals; arranging the interchangeable set of memory signals in outer columns of the array is connected; and the array is connected the internal fixed set of memory signals arranged in a column, wherein said inner column is a column located at the middle of the array are connected, and the column is the column located at the peripheral edge of the connection array. 9.如权利要求8所述的方法，确定存储器信号的可互换集的操作还包括将行内地址连接标识为可互换。 9. The interchangeable set operation method according to claim 8, further comprising determining a memory connected to the signal identifying the row address interchangeable. 10.如权利要求8所述的方法，确定存储器信号的可互换集的操作还包括将区段地址连接标识为可互换。 10. The interchangeable set operation method according to claim 8, further comprising determining the signal memory connected to the sector address identification are interchangeable. 11.如权利要求8所述的方法，在外围列中排列存储器信号的所述可互换集的操作还包括在所述连接阵列的每一侧上的一个或两个外围列中排列存储器信号的所述可互换集。 11. The operation method of claim 8, wherein the arrangement of memory signals in outer column further comprises a set of interchangeable or two outer columns on each side of the connection arrangement of the memory array of signal the interchangeable set.